If you want to catch more fish, there are few better ways to spend your money than purchasing a good fish finder. 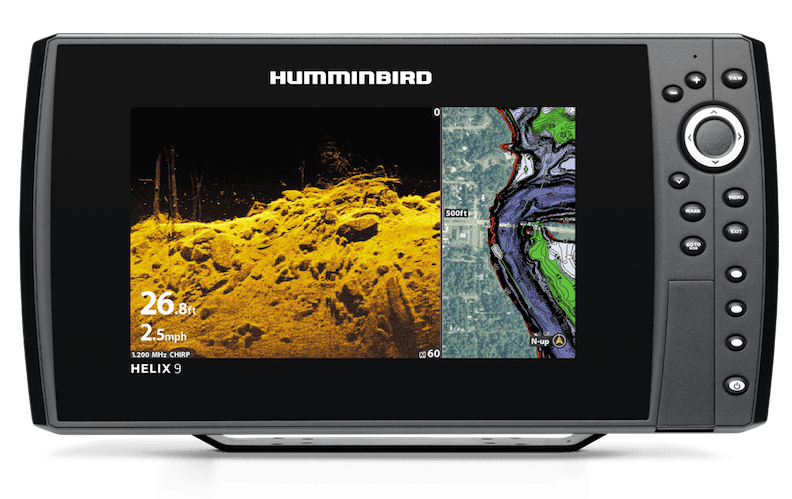 The Humminbird HELIX 9 represents this year’s overall category winner for Best Fish Finder, making it the best all-around choice for tech-savvy anglers. Skip down to read more about the Humminbird HELIX 9. Anglers seeking an impressive tech package at an affordable price should consider the Garmin STRIKER Plus 4cv. Skip down to read more about the Garmin STRIKER 4cv. 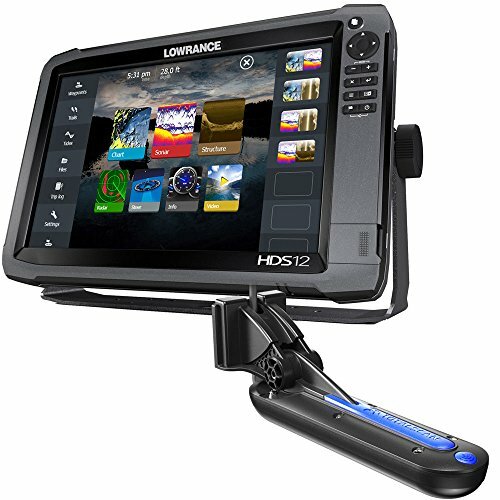 The HDS12 GEN3 from Lowrance is a choice for anglers looking for a high tech choice where cost is no constraint. 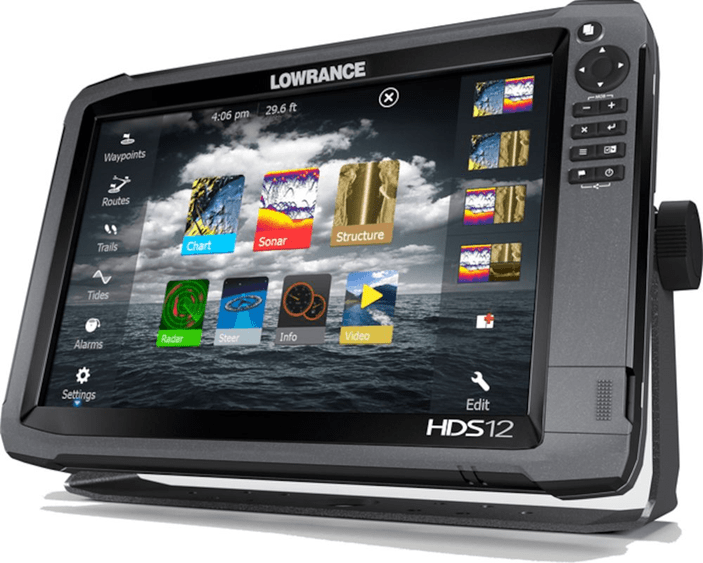 Skip down to read more about the Lowrance HDS12 GEN3. Raymarine’s Dragonfly 7PRO represents a well-balanced mix of solid-state technologies at a mid-tier price. Skip down to read more about the Raymarine Dragonfly 7PRO. Anglers seeking technological innovation should consider the Deeper Smart Sonar PRO+, an impressive package that hints at fishing’s Internet-of-Things future. Skip down to read more about the Deeper Smart Sonar PRO+. New rods, lures and lines can certainly help improve your fishing success, but fish finders provide something none of these other things can: information about the watery world you’re fishing. However, fish finders vary widely in terms of quality, features and ease of use. With those and more criteria in mind, we’ve detailed five of the leading fish finders available in 2019 and tried to illustrate the primary differences between the units. This guide should help you discover the best fish finder for you, depending on where your category of fishing technology preferences. It doesn’t matter how much data your fish finder collects if it can’t display the information in a clear and easy-to-see manner. It is almost always preferable to select a unit with the largest display screen your budget allows, but it is also important to select a screen that has a good resolution and produces clear, crisp images so that you can appreciate the subtleties of the underwater world. It is also important to remember that you may be fishing during a variety of different light levels and weather, so you want a display screen that is easy to read in any conditions you’ll face. 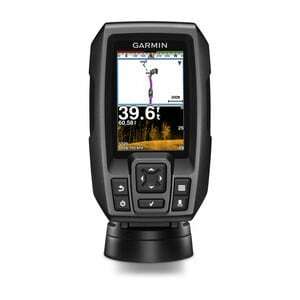 Some of the nicest fish finders feature fog-resistant displays, which provide even more value. Scanning sonar technology provides some of the most detailed images possible with a fish finder, and most anglers will find this type of imaging to be incredibly helpful for taking their fishing to another level. Different manufacturers use slightly different versions of the technology, which produce varying levels of detail. The best models will allow you to appreciate individual branches on sunken trees, small rocks along the bottom and individual fish with ease. Scanning transducers either face down toward the bottom (down-imaging) or out to the sides of your boat (side-imaging). Down-imaging fish finders are more common and affordable, but those that also feature side-imaging capabilities provide a wealth of additional information that you can use to locate and catch the fish. Modern anglers often have a variety of electronic devices on their boat and person, including tablets, smartphones and navigational tools, among others. But rather than using each of these devices individually, you can use them to control or interact with your fish finder, if you select a model that is capable of connecting to these devices and compatible with them. Several fish finders (including a few detailed below) are capable of connecting to other devices via wireless or Bluetooth technology. Leveraging the combined powers of your fish finder and your other electronic devices can help you find and catch more fish. Any good fish finder will help you find more fish and visualize the structures and features of a given body of water, but some of the best models also provide GPS data. This will allow you to know where you are on the water and better access the entire lake or river. You can even mark productive fishing spots, so you can revisit them in the future. But, in addition to GPS functionality, some high-end fish finders also provide chart plotting capabilities. Such fish finders often work with navigational charts or maps and allow you to navigate around the water with ease. Different charts and maps come with different models and packages, so be sure to consider what is included in the unit when making your choice. You may want a high-powered fish finder that collects a ton of data and provides you with a variety of ways to view it, but that doesn’t mean you want to spend your day messing around with your fish finder. You want to be able to concentrate on fishing while using your fish finder to point you in the right direction. This means that you’ll want a fish finder that has an easy-to-use, user-friendly interface. There are pretty significant differences between the user interfaces of various fish finders on the market, and different anglers prefer ones. Most of the high-end fish finders on the market have intuitive interfaces, but you’ll want to be extra careful when purchasing entry-level units, particularly if you are not very comfortable with electronics. Most good fish finders collect a wealth of information, but the best models allow you to visualize this data in a number of different ways. For example, the best fish finder displays provide split-screen functionality, so you could see two types of data simultaneously. This would allow you to view bottom contours along with your GPS map at the same time, or any number of other combinations. Additionally, you’ll want a fish finder with adjustable or customizable colors and display images to make it easy for you to see the types of things that are important to you. For example, some units replace the traditional sonar arcs with small fish icons to help allow you to spot fish at a glance. Along with the basic characteristics and capabilities you’ll want in the best fish finder, you’ll want to consider the unique features different brands and manufacturers provide. These often differ significantly from one product line to the next, and they can have a strong influence on your purchasing decisions. Proprietary Scanning Technology – Some manufacturers use scanning transducers that use much higher frequency signals to probe the depths than traditional scanning sonars do. This provides an incredible amount of detail, which you can use to learn more about the world beneath the water. Map-Making Functionality – Any unit competing for the best fish finder title not only works with charts and maps, but allows you to create your own custom maps while fishing. By combining a custom-made map with one of the maps included with the fish finder, you may be able to simultaneously view things like bottom composition and depth, or vegetation. Radar – A few of the better-equipped fish finders on the market not only image the things below the surface, they also use radar technology to help keep you aware of obstacles and objects above the surface too. This is extremely helpful for both navigation and safety. Touch-Screen Functionality – Many of the newer fish finders allow you to control the device via a touch-screen interface, as you would your phone or tablet. While most anglers probably prefer this type of interface to those of traditional units, which feature physical knobs and buttons, others find them difficult to use with wet or gloved hands. Accordingly, the very best fish finder models allow you to control the device with either the touch-screen interface or traditional buttons. Below, you’ll find in-depth info on our choices for the five best fish finder of 2019. 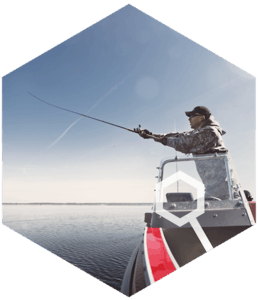 Be sure to select the model that will best fit your fishing needs and provides the features and characteristics that will help in your unique circumstances. 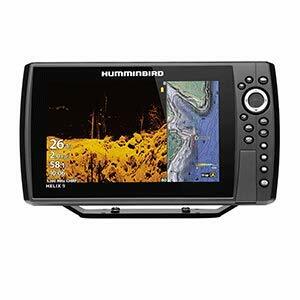 The Humminbird HELIX 9 is a feature-packed, easy-to-use fish finder that is one of the best options for most anglers. You can purchase the HELIX 9 in any of four different options packages, varying from relatively stripped-down models which lack things like scanning sonars, to those with impressive features and options, including proprietary scanning technologies and side-imaging capabilities. All four models in the HELIX 9 series provide GPS functionality, connect quickly and easily to other devices and feature a high-quality, easy-to-see 9-inch display screen. It’s easy to see why the HELIX 9 takes a commanding pole position in the Best Fish Finder category. While budget-limited anglers should certainly give consideration to the entry-level version of the HELIX 9 (HELIX 9 CHIRP GPS G2N), those without such limitations will surely prefer the best-equipped model in the series – the HELIX 9 CHIRP MEGA SI GPS G2N. 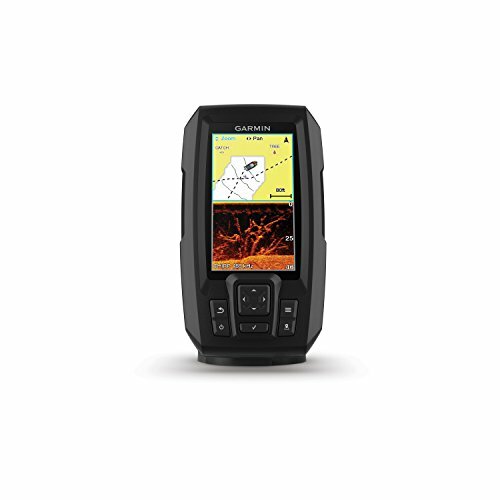 Equipped with everything the HELIX 9 CHIRP GPS G2N has, plus Humminbird’s proprietary MEGA Down- and Side-Imaging capabilities, the HELIX 9 CHIRP MEGA SI GPS G2N provides some of the most detailed images of any fish finder on the market. Other important features provided by the HELIX 9 CHIRP MEGA SI GPS G2N include AutoChart Live, which allows you to make custom maps on the go and Bluetooth and Ethernet compatibility. Additionally, this fish finder comes with Smart Strike functionality, which uses historical data and weather conditions to point you in the direction of the fish. See our dedicated Humminbird HELIX 9 Review. One of the very best fish finder options for beginning and casual anglers, the Garmin STRIKER 4cv is a small and affordable fish finder, which still has a number of excellent features. While the Striker 4cv doesn’t come with some of the high-end features included on more expensive units, it provides great value for the price and it will certainly help you find and catch more fish. Equipped with CHIRP technology, the Striker 4cv produces crystal-clear, highly detailed images of the underwater world. But, it also comes with scanning sonar capabilities, called ClearVu. Garmin’s version of down-imaging sonar, ClearVu helps you see incredible levels of detail, including individual pieces of cover and small baitfish, lurking beneath your boat. It also includes a dedicated flasher circuit, which can be helpful when you are vertically jigging for fish or when you head out to fish on top of the ice. The included GPS module allows you to determine where you are on the water, as well as your traveling speed. You can even save waypoints directly to the unit so that you can go back and revisit productive fishing holes in the future. The Garmin STRIKER 4cv can also be helpful for anglers on the go, as it can be purchased with a portability kit, which will make it easy to take the STRIKER 4cv with you. This makes it a great option for those who rent boats or fish from a kayak, and need to be able to take the fish finder home with them each night. In all, it’s a solid choice and a natural fit among the finalists in the 2019 Best Fish Finder category. See our in-depth Garmin STRIKER 4cv Review. The Lowrance HDS-12 Gen3 is a premium, high-end fish finder that is packed with useful features and tools. Priced at the high end of the fish finder cost spectrum, this unit is probably priced out of the reach of casual anglers, but it will provide serious and professional anglers with exactly the type of performance they require. One of the first things you’ll notice about the Lowrance HDS-12 Gen3 is its easy-to-see, 12-inch-wide screen, which makes it easy to see the finest details of the water below, thanks to its industry-leading screen brightness. But, even more importantly, the Lowrance HDS-12 Gen3 provides both down- and side-imaging capabilities to ensure the high-quality display screen has plenty of information to show (and you can display this information in a variety of ways). Additionally, the Lowrance HDS-12 Gen3 comes with a number of cartography options to help you navigate around your favorite lake or river, and it also provides autopilot capabilities, thanks to Lowrance’s SmartSteer technology. The Lowrance is also very easy to connect to other devices, as it uses both Ethernet and NMEA 2000 connectivity. You can even display data from other devices on the screen, by using the included video input port. The Lowrance HDS-12 Gen3 is also capable of storing a lot of data, including up to 3,000 waypoints, 100 routes and 100 trails. It also features dual micro SD card slots, so you can transfer or access information recorded on other devices. In all, a robust package and a natural inclusion among the finalists in the 2019 Best Fish Finder category. See our in-depth Lowrance HDS-12 Gen3 Review. 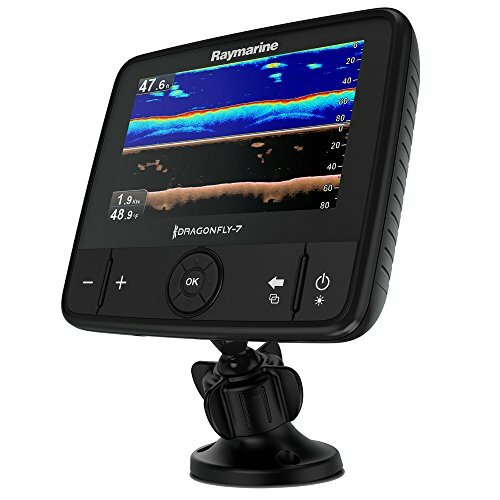 The Raymarine Dragonfly 7PRO is a great fish finder for the price, and it deserves consideration from all anglers shopping at the entry-level to intermediate price class. Despite being priced very reasonably, the Dragonfly 7PRO has a lot of features that are normally found on much more expensive models, making it an easy finalist in the Best Fish Finder category. For example, the Dragonfly 7PRO not only features down-imaging capabilities but, unlike traditional down-imaging scanning sonars, the Dragonfly 7PRO uses CHIRP technology to provide highly detailed images. CHIRP technology works by emitting signals across a range of frequencies, rather than traditional down-imaging transducers, which only produce a single frequency. 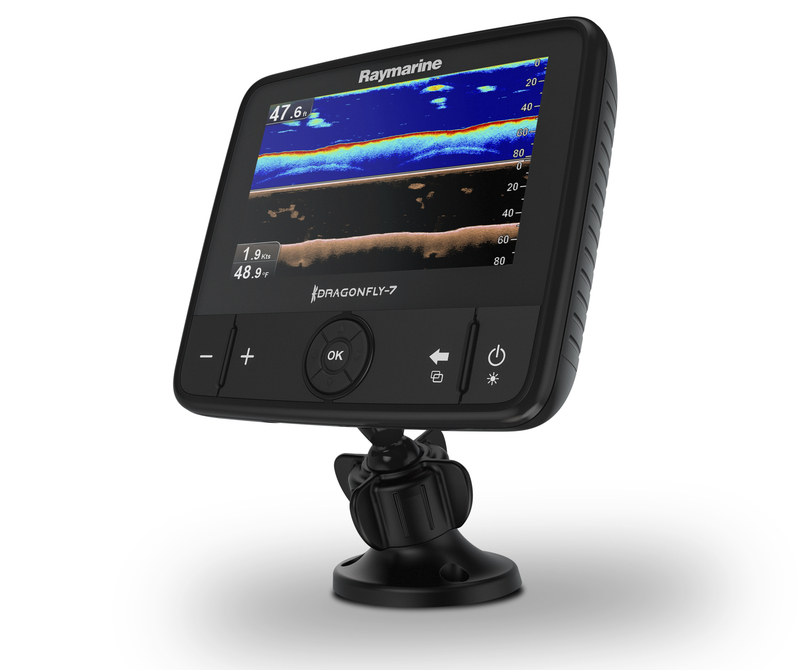 The Raymarine Dragonfly 7PRO also comes with one of the best display screens in its class. Optically bonded, this display is one of the brightest screens available and is optically bonded to ensure it won’t fog up when the weather is bad, and the fishing is good. The Dragonfly 7PRO also provides a number of other helpful features, including wireless functionality and the ability to use Raymarine’s Wi-Fish mobile app along with the unit. This allows you to control your fish finder from your smart phone, which can be especially helpful if you are fishing at the opposite end of your boat from the console. The Raymarine Dragonfly 7PRO comes with pre-loaded maps and charts and also gives you the ability to make your own, custom maps as you go. See our in-depth Raymarine Dragonfly 7PRO Review. If you fish from the shore, or you are just interested in dipping your toe in the fish finder market, the Deeper Smart Sonar PRO+ is a great option. A castable fish finder, you can place the Deeper Smart Sonar PRO+ anywhere within casting range, thereby allowing you to see what’s going on below the surface. 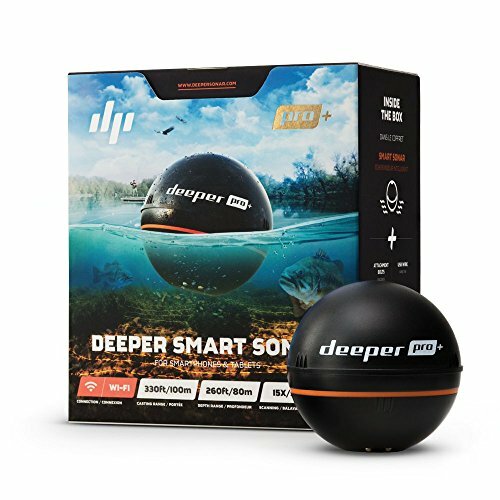 But despite being an entry-level fish finder, the Deeper Smart Sonar PRO+ is very accurate and packed with important and helpful features, which will improve your chances of finding and catching more fish. For example, it features an internal GPS module and mapping function, which will allow you to create your own custom maps of the lake or river you are fishing. You can also mark waypoints, so you’ll have no trouble finding previously productive fishing spots. The Deeper Smart Sonar PRO+ does not come with a display screen; you must use your smartphone to visualize the data collected by the castable transducer. However, unlike some other, lower-quality castable fish finders, the Deeper Smart Sonar PRO+ has an impressive range and will continue to connect to your phone when up to 330 feet away. The Deeper Smart Sonar PRO+ doesn’t provide scanning sonar capabilities, but few (if any) castable units do either, so this is to be expected. However, it still provides very high-quality images and is capable of scanning depths of up to 260 feet. Given its leading position in a relatively new category of castables, FishingTech has gone out on a limb including the PRO+ in our short list for Best Fish Finder, but it’s well deserved. 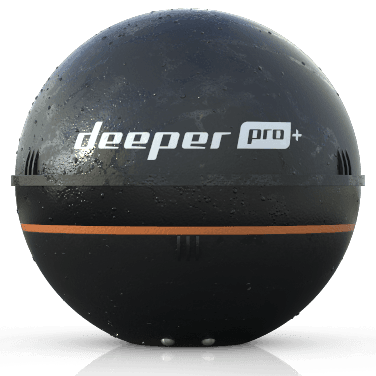 Read our full Deeper Smart Sonar PRO+ Review. Fish finders are very helpful tools, which all anglers should consider mandatory equipment, regardless of their skill level or the amount of time they spend fishing each week. Any of the five models detailed above should help you find and catch more fish, but it is important to select the model that best meets your needs.